You don't need an expensive membership to a fancy health club to stay fit. Between your own apartment home and the on-site amenities of our Springs Apartments communities, there are numerous workout opportunities that require little or no money and equipment. Here are some of our favorite tips and ideas to keep you active and healthy. Effective workout programs include a balance of strength and cardio training. Doing strength indoors and cardio outdoors is convenient and provides a nice change of scenery to keep you motivated. The best strength and toning exercises involve resistance to work your muscles. Exercises that use your own bodyweight for resistance include stomach crunches, squats, lunges and push-ups. A sturdy dining chair provides support for triceps dips, step-ups and calf raises, along with jump-ups to develop speed and explosiveness. For a simple but tough toning exercise, place your back against a wall or counter while bending your knees at a 45º angle as though you were sitting in a chair. Hold the position as long as possible. If you want more of a challenge, invest in a set of hand weights or resistance bands. Did you know the resort-style pools at our Springs communities are also a great setting for toning exercises? Water is a unique source of resistance that also has a cushioning effect, making it less stressful on joints and muscles. No matter what type of physical activities you enjoy, you'll find them in and around our Springs communities. Walking, jogging and running are all-purpose workouts that can be done anywhere at any time. The only equipment required is a sturdy pair of appropriate shoes. Bike riding is an eco-friendly activity that builds stamina while you explore different areas, either close to home or at scenic park trails. Swimming is an excellent full-body workout. You can perform your entire routine in our Springs pool by combining water aerobics with toning exercises. Weather's not cooperating? No problem! Jumping jacks and walking or jogging in place are perfect indoor cardio activities. Our Springs fitness centers provide all-inclusive solutions to your workout needs. 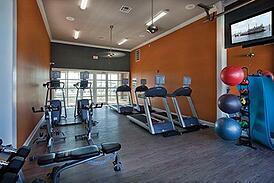 They include cardio machines, weights for strength training, and an area devoted to Yoga and Pilates practice. Best of all, you have 24/7 access to accommodate the busiest schedules. We'd love to hear your best fitness and exercise tips. Share them with us in the comments!